Many times part of your New-Year’s Goals is to declutter. I know many various decluttering tasks are certainly sprinkled liberally in my monthly New Year’s Goals! 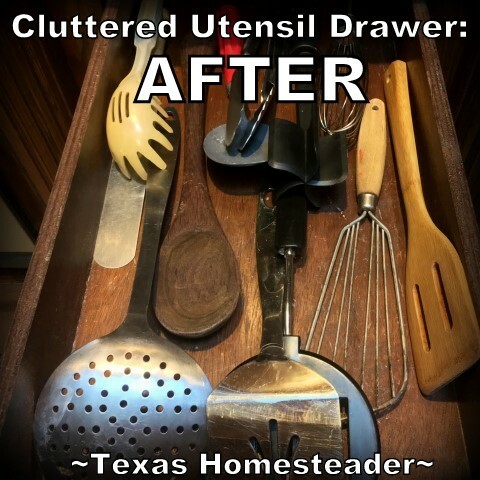 One area that has been sorely needful of decluttering is my utensil drawer. Now out of financial necessity and environmental sensitivity, I’m in my kitchen cooking from scratch daily. So much cooking necessitates the right tools to get the job done. (Plus let’s be honest, I’m a kitchen-utensil junkie. eh hemmmmm!) So when RancherMan & I were unloading the dishwasher one day he half-teasingly mentioned the state of the utensil drawer. I knew something had to give! Here’s what I did: I took the entire contents of my utensil drawer and dumped it on the counter. I sorted out the no-exception tools that I use all the time or that once belonged to my grandmother. My stainless-steel spatula, another non-scratch spatula for my stainless-steel pans, my grandmother’s antique wire whip, the vintage heavy-duty potato masher, cookie scoops, heavy stainless whisk and some of my wooden utensils were put aside. Much of what was left was either a duplicate of something I had or something that was used pretty sparingly. I dumped all of those utensils in a box and placed the box in the office. That way if I found I needed something it was right there for me to fetch it. I had to be brutal with the culling though. It was important to remove thoughts of ‘maybe someday I’ll need this‘ or ‘this utensil is too good to give away‘ when dumping utensils into the box. But I find that’s always the case when decluttering whether the closet, your office or the kitchen. Be strong! Now after 30 days I’ll bundle up anything left in that box and send it off to Goodwill or perhaps offer it to someone just starting out in their own home. 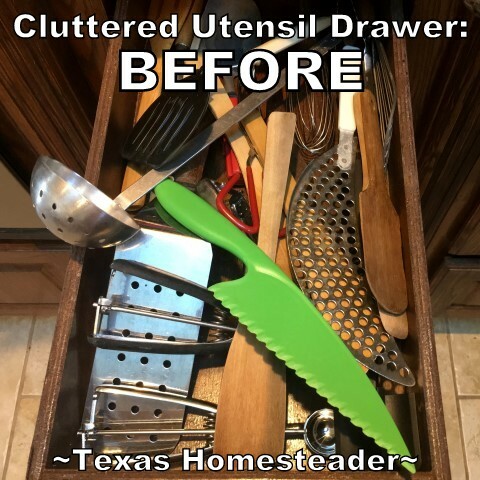 In the meantime my utensil drawer is less crowded and it’s so easy for me to find the utensil I’m looking for quickly. Things no longer get snagged on other utensils when I’m trying to fetch them. This has improved the efficiency in my kitchen mega fold! I must say this has been by far my easiest decluttering move this year. Give it a try! This entry was posted in Blog Posts and tagged Cooking on January 24, 2018 by Texas Homesteader. My husband and I are getting ready to sell our house so most of the kitchen has been packed up along with all of the other rooms. I left only essential kitchen tools in one drawer. I am amazed how well we are getting along without all the other stuff. I’ve got a feeling that when we get to our new home there will be a large donate pile (and I did purge and donate before packing this time!). I haven’t missed much of anything that did get packed up. I do miss some of my shoes though – it will be like Christmas when I unpack those! Hey Candace, Funny you should mention that about climate change. I just started a book called, “The Little Ice Age” I literally just started about 1/2 an hour ago. But it’s non fiction and about climate changes in the past. Tammy did you ever get the, “Year of Plenty” book? I’ve been reading quite a bit so Kaleigh sees me reading and maybe it’ll give her incentive to read. I just finished one about the Triangle Shirt Waist factory fire. Many years ago I went through cupboards and drawers in the kitchen looking at things I had collected over the years to see what could do two jobs so as to get rid of (read a box in the basement). I asked myself what could do two jobs and eliminate something, a biscuit cutter could go because a drinking glass will do the job just as well and heaven knows I have plenty of those. Same with things I inherited when my mother died – so I have a blender in the basement and a hand mixer and so on. I actually would never need two blenders but one might “die” and so I have a spare and a big basement. But my bigger problem is being a hoarder of glass jars, not just canning jars (many of which I have now given to the friend up the road and the daughter of another friend just starting out canning as I have recently decided my canning career is at a close. But those Adams peanut butter jars – glass – metal lid- useful for storing small amounts of dry goods – now I ask you!!! Who could throw those out?!! They may be plastic the next time I’m at the grocery store!! !